Arts Missoula’s annual Arts & Culture Awards honor individuals and organizations whose outstanding work in the arts and humanities have made a significant contribution to the community’s quality of life. The 2018 awards will be presented at the Missoula Arts & Culture Awards Luncheon on Thursday, March 22, at the DoubleTree Hotel from 11:30 a.m. to 1 p.m. This year's Cultural Achievement award, honoring someone who has consistently supported the arts community in numerous ways, is awarded to Sharon Snavely for her service on the boards of the Missoula Symphony Association, Missoula Art Museum, UM College of Visual & Performing Arts and other organizations. The Individual Artist, presented to someone who has shown exceptional achievement in their chosen craft, is awarded to James Lee Burke, national bestselling author of 38 novels. The Arts Educator, honoring an outstanding local teacher who has devoted a career to the arts, is awarded to H. Rafael Chacon, professor of art history and criticism at the University of Montana. 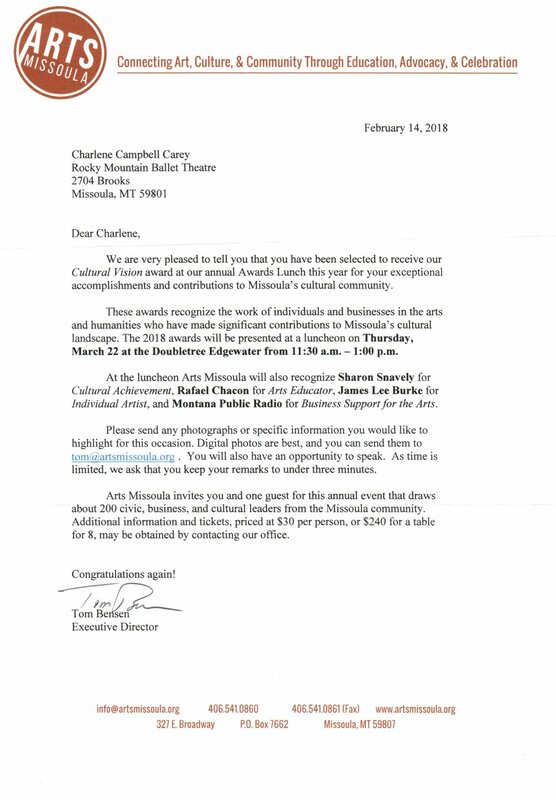 The Business Support for the Arts, given to businesses that have provided long-term support to Missoula’s artists and arts organizations, is awarded to Montana Public Radio. 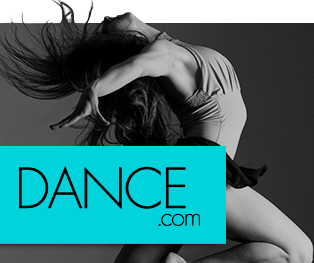 The Cultural Vision award, honoring artistic programming, is awarded to Charlene Campbell Carey, founder and artistic director of the Rocky Mountain Ballet Theatre, VIBE and Ballet Beyond Borders. Another feature of the Arts & Culture Awards luncheon is that local businesses sponsor tables for their employees and guests. Tickets for the event are $30 each or $240 for a table of 8 and may be reserved by calling 406-541-0860 or info@artsmissoula.org. For more information, visit artsmissoula.org. RMBT NEWS!!!!!! Congratulations to RMBT Artistic Director Charlene Carey for being selected to receive the Cultural Vision award!